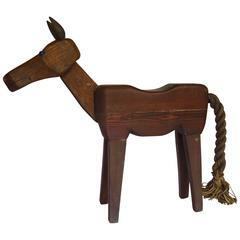 Unusual Folk Art chair by Altamira, Italy. Painted blue at some point with added leg supports but charming nonetheless. Pair of chic Italian brass bar stools with vinyl seat cushions, in very good vintage condition. Armchair by Altamira editions, Portugal, 1960s. 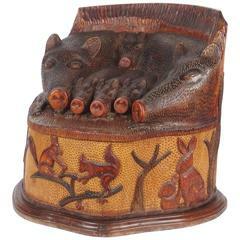 Folk Art stool with a &quot;boar&quot; family sculpted on the seat and a base decorated with squirrels, trees, rabbits and stag. Carved and stained wood. Altamira armchairs, Portugal, 1960s, pau santo wood, recently reupholstered with a grey velvet. Altamira armchair, Portugal, 1960s. Recently re-upholstered with a yellow velvet. Jacaranda wood and simili leather armchair, Altamira manufacturer, Portugal, 1960s.